Day 29 – 30 in 30 Challenge – Really? This guy is saying, “Really?” Just one more painting after me. Wow! The 30 in 30 is almost finished… Can’t believe…. rest and relaxation are on the horizon…. Hope you have a wonderful Monday… We’re off to check on the subject for that last painting. 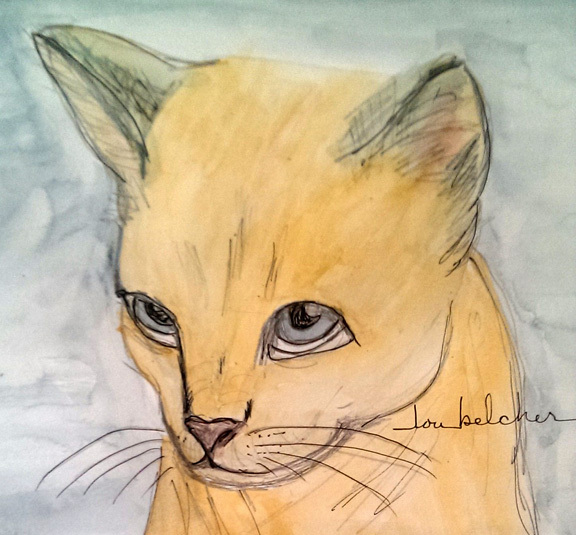 This entry was posted in art and tagged 30 in 30, cat art, Day 29, Really. Bookmark the permalink. 18 Responses to Day 29 – 30 in 30 Challenge – Really? We love how the cat is smiling – only one more to go for you! Thanks for stopping by ….. Yes, the cat does have a little smirk going on. Maybe it’s because there is only one more painting in the challenge. Pensive. Musing ly thoughtful.. I love it. Does anyone else see “pensive?” Or Is it my projection. Maybe amusingly thoughtful… I think I see a little smirk on his face. That is a sweet smile and you so deserve some relaxation time. Have marvellous Monday. Very nice painting. Yes, you so deserve a rest. Doing a painting a day has to be a hectic schedule. Mario… Thanks so much for your comments during the challenge. I think we’ll all take your advice and put in for R & R tomorrow…. Thanks M and M…. I’m glad you like this kitty and thanks for coming by… Yes, I think he looks a little like a cub too. beautiful! Almost looks like a lioness! Thanks Cody and Caren….. Maybe she’ll grow up to represent Detroit…. Thanks so much for your comments over the month. You spur me on…. What a handsome guy! I can’t wait to see the final painting! Thanks…he thinks he’s pretty handsome too. I’ll be sure to show you the finished painting when I complete it. And thanks so much for all your comments and encouragement during the Challenge. Very nice! These 30 days have gone by so fast! Thanks for all the comments over the month. You’re right, the 30 days flew by.